The proposed Water Legacy Act would amend Michigan’s principal environmental statute, the Natural Resources and Environmental Protection Act. Gov. 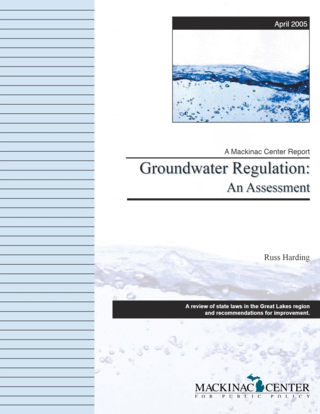 Granholm first called for new groundwater regulations in her January 2004 “special message” to the Legislature. The proposed act was introduced the following March, but failed to win lawmakers’ approval. The package of bills was reintroduced in the Senate on Jan. 12, 2005, and awaits action in the Committee on Natural Resources and Environmental Affairs. Companion legislation was introduced in the House on Feb. 2, 2005, and referred to the Committee on Natural Resources, Great Lakes, Land Use, and Environment. The anticipated effects of the withdrawal on water resources and land use in the Great Lakes basin. A five-year water-conservation plan detailing management practices to reduce withdrawals or consumptive uses, and proposed improvements. An explanation of why alternative conservation measures will not be undertaken. Evidence that all adjacent property owners have received written notification of the proposed withdrawal. Any other information required by the DEQ. A permit application for new or increased consumptive use averaging more than five million gallons per day in any 30-day period must undergo review by all states and provinces under the Great Lakes Charter. A public hearing also must be held for all such applications. An industrial or processing facility, or well or pump with the capacity to withdraw over 100,000 gallons of water per day, on average, in any consecutive 30-day period. An irrigation facility with the capacity to withdraw over 100,000 gallons of water per day, on average, in any consecutive 30-day period. A farm with the capacity to withdraw over 100,000 gallons of water per day, on average, in any 30-day period (unless in possession of a water-withdraw permit from the DEQ or reporting water use and submitting a conservation plan to the Department of Agriculture). A public water-supply system with the capacity to withdraw over 100,000 gallons of water per day, on average, in any consecutive 30-day period (unless already reporting withdrawals under the Safe Drinking Water Act).